The Japanese multinational consumer electronics company Nintendo has developed seven home video game consoles and multiple portable consoles for use with external media, as well as dedicated consoles and other hardware for their consoles. As of September 30, 2015[update], Nintendo has sold over 722.22 million hardware units. Although the company had released Color TV Game also Game & Watch, which were their first and second systems respectfully, they did not achieve worldwide success until the release of the Nintendo Entertainment System (NES) in 1983. The NES restarted the video game industry after the video game crash of 1983, and was an international success. In 1989, Nintendo released the Game Boy, which became the first handheld console to sell in large numbers. In the early 1990s, Nintendo's market lead began to decrease; although the 1990 Super Nintendo Entertainment System (SNES) was a strong seller, the Mega Drive/Genesis was a very strong contender. Nintendo and Sega would both lose a significant portion of the console market towards the end of the 1990s, as Sony Computer Entertainment's PlayStation became the most popular console, beating the Nintendo 64, though Nintendo managed to sell more than Sega Saturn. The Dreamcast, released in 1999, PlayStation 2, released in 2000, and Microsoft's Xbox, released in 2001, would eventually relegate Nintendo to third place in the international market, despite the release of the GameCube. However, they retained their lead in the handheld console market, with the Game Boy Color and Game Boy Advance models. Towards the middle of the 2000s, Nintendo introduced the first successful handheld device with a touch screen (DS) and the first successful console designed for motion controlled inputs (the Wii); they became some of the best-selling consoles of all time. In 2010, Nintendo became the first major company to release a handheld game console with stereoscopic 3D capabilities, with the 3DS, which had very strong sales from the beginning. The Wii U, released in 2012, was much less successful, and sales were significantly lower than predicted. The company's most recent console, Nintendo Switch, was released in March 2017 and has now surpassed the entire lifetime sales of the Wii U. Color TV-Game 6, released June 1, 1977, with six variations of Pong: Tennis, Hockey, and Volleyball in Singles or Doubles mode. Sold approximately 1 million units. Color TV-Game 15, released June 8, 1978, with 15 variations of Pong. This was the most popular console in the series, selling just over 1 million units. Color TV-Game Racing 112, released June 8, 1978, with a racing game. Notable for being the first Nintendo project that Shigeru Miyamoto worked on. Sold approximately half a million units. Color TV-Game Block Breaker, released April 23, 1979, with a game based on Breakout. Sold approximately half a million units. Computer TV-Game, released in 1980, with Computer Othello. Sold in limited quantities. Released July 15, 1983, the Nintendo Entertainment System (NES) is an 8-bit video game console released by Nintendo in North America, South America, Europe, Asia, Oceania and Africa and was Nintendo's first home video game console released outside Japan. In Japan, it is known as the "Family Computer" (or "Famicom", as it is commonly abbreviated). Selling 61.91 million units worldwide, the NES helped revitalize the video game industry following the video game crash of 1983 and set the standard for subsequent consoles in everything from game design to business practices. The NES was the first console for which the manufacturer openly courted third-party developers. Many of Nintendo's most iconic franchises, such as The Legend of Zelda and Metroid were started on the NES. Nintendo continued to repair Famicom consoles in Japan until October 31, 2007, attributing the decision to discontinue support to an increasing shortage of the necessary parts. Nintendo released a software-emulation-based version of the Nintendo Entertainment System on November 10, 2016. Called the NES Classic Edition, it is a dedicated console that comes with a single controller and 30 preloaded games. Released November 21, 1990, The Super Nintendo Entertainment System, officially abbreviated the Super NES or SNES and colloquially shortened to Super Nintendo, is a 16-bit video game console released by Nintendo in North America, South America, Europe, Asia, Oceania and Africa. In Japan it is known as the Super Famicom. In South Korea, it is known as the Super Comboy and was distributed by Hyundai Electronics. The Super NES was Nintendo's second home console, following the Nintendo Entertainment System. Whereas the earlier console had struggled in the PAL region and large parts of Asia, the Super NES was a global success, albeit one that could not match its predecessor's popularity in Northeast Asia and North America—due in part to increased competition from Sega's Genesis console (released in Europe as the Mega Drive). Despite its relatively late start, the Super NES became the best selling console of the 16-bit era, selling 49.10 million systems worldwide. The Super NES library is known for upgrading some of Nintendo's most famous franchises, and making the games even more critically acclaimed, such as Super Metroid, The Legend of Zelda: A Link to the Past, Final Fantasy IV and VI, Donkey Kong Country and Super Mario World, as well starting some popular franchises such as Star Fox and Mega Man X. The Nintendo GameCube (commonly shortened to GameCube, NGC or GCN) was released in 2001. It was Nintendo's sixth generation game console, the same generation as Sega's Dreamcast, Sony's PlayStation 2 and Microsoft's Xbox. Until the console's unveiling at SpaceWorld 2000, the design project was known as Dolphin—this can still be seen in the console and its accessories' model numbers. 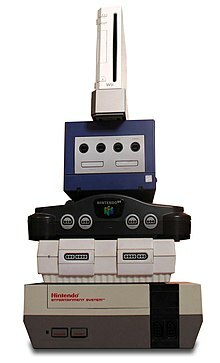 The GameCube is the most compact sixth generation console. The GameCube is Nintendo's first game console to use optical discs rather than game cartridges. An agreement with the optical drive manufacturer Matsushita led to a DVD-playing GameCube system named the Panasonic Q, which was only released in Japan. Much of Nintendo's core line-up centered on sequels to their established hit franchises such as Super Mario Sunshine, Super Smash Bros. Melee, The Legend of Zelda: Wind Waker, Metroid Prime, Pokémon Colosseum and Star Fox Adventures, while new franchises like Animal Crossing and Pikmin were born, although the former franchise had seen a Japan-exclusive release on the N64. The GameCube has sold 21.74 million units. 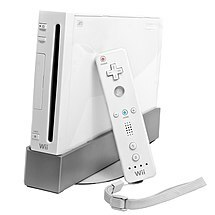 The Wii was released on November 19, 2006 as Nintendo's seventh-generation home console. Nintendo designed the console to appeal towards a wider audience than those of its main competitors, the PlayStation 3 and Xbox 360, including "casual" players and audiences that were new to video games. These aims were emphasized by the console's distinguishing feature, the Wii Remote—a handheld motion controller that can detect motion and rotation in three dimensions, using a mixture of internal sensors and infrared positioning. The controller includes an expansion port that can be used to connect other accessories, such as the Nunchuk—an attachment with an analog stick and additional buttons, a "Classic Controller" gamepad providing a traditional control scheme, and Wii MotionPlus—an accessory designed to enhance the motion detection capabilities of the original Wii Remote models. The Wii's internal hardware is an updated derivative of that of the GameCube; in comparison to its seventh-generation competitors, the Wii had lower overall graphics capabilities, and does not output in high-definition. The Wii also featured internet-enabled features; the Nintendo Wi-Fi Connection service allowed supported games to offer online multiplayer and other features, while the WiiConnect24 feature allowed messages and updates to be downloaded while the console was in standby. Through Wii Shop Channel, additional games and apps can be downloaded or purchased for the console, including Virtual Console—a selection of classic video games emulated from older consoles. Early models of the Wii also had backwards compatibility with GameCube games and controllers, but this was dropped from later hardware revisions. The Wii was a major success for Nintendo; in April 2007, the Wall Street Journal declared that Nintendo had "become the company to beat in the games business", citing the success of the Wii and the portable Nintendo DS line. As of March 31, 2016[update], the Wii has sold 101.63 million consoles worldwide. Wii Sports—a collection of sports minigames that were designed to leverage the Wii Remote, was bundled with the console outside of Japan, and had a major cultural impact as the console's "killer app" among the mainstream audience. Wii U and its GamePad. The Wii U was released on November 18, 2012 as a direct successor to the Wii, and the first entry in the eighth generation of home video game consoles. The Wii U's distinguishing hardware feature is the GamePad, a tablet-like controller which contains a touchscreen that wirelessly streams a video output from the console. The GamePad's display can be used to provide alternative or complimentary perspectives within a game, or as the main display in lieu of a television. In particular, Nintendo promoted the concept of "asymmetric" multiplayer, where a player with the GamePad would have a different objective and perspective than that of other players. Alongside the GamePad, the Wii U supports Wii controllers and games. A conventional gamepad known as the Wii U Pro Controller was also released. The Wii U features more-extensive online functionality than the Wii, using the Nintendo Network platform; as with the Wii, it supports online multiplayer and downloading and purchasing new games and apps, but also allows video chat. It previously featured an internal social network known as Miiverse, which allowed users to write and draw posts in game-specific communities, the service was discontinued on November 8, 2017. Nintendo also attempted to provide second screen experiences for television programming for the Wii U through a feature known as Nintendo TVii, but it was discontinued outside of Japan in August 2015. Unlike the Wii, the Wii U's hardware is capable of high-definition graphics. The Wii U received an initially tepid response, credited to a weak launch lineup, diminishing third-party commitment to the platform, as well as the subsequent release of the PlayStation 4 and Xbox One the following year. However, some critics argued that the Wii U still had advantages over PS4 and Xbox One, including its lower cost and notable early exclusives such as Super Mario 3D World. Sales steadily increased following the release of several notable first-party exclusives, including new entries in the Mario Kart and Super Smash Bros. franchises, and the new franchise Splatoon. In January 2017, a Nintendo spokesperson stated that production of the console had ended, with just 13.56 million units sold. The Nintendo Switch, docked and with controllers detached. The Nintendo Switch was released on March 3, 2017 and is Nintendo's second entry in the eighth generation of home video game consoles. The system was code-named "Nintendo NX" prior to its official announcement. It is a hybrid device that can be used as a home console inserted to the Nintendo Switch Dock attached to a television, stood up on a table with the kickstand, or as a tablet-like portable console. It features two detachable wireless controllers called Joy-Con, that can be used individually or attached to a grip to provide a more traditional game pad form. Both Joy-Con are built with motion sensors and HD Rumble, Nintendo's haptic vibration feedback system for improved gameplay experiences. However, only the right Joy-Con has an NFC reader on its analog joystick for Amiibo and an IR sensor on the back. The Nintendo Switch Pro Controller is a traditional style controller much like the one of the Gamecube. The console's reveal trailer premiered on October 20, 2016 and showcased the hybrid functionality of the system as well as footage from The Legend of Zelda: Breath of the Wild and from potential new titles in the Super Mario, Mario Kart, and Splatoon franchises. These unknown games were later announced to be Super Mario Odyssey, Mario Kart 8 Deluxe, and Splatoon 2 respectively. The Nintendo Switch has sold 32.27 million units as of December 21, 2018, outselling the Nintendo GameCube within its first two years of launch. Nintendo's Virtual Boy (also known as the VR-32 during development) was the first portable game console capable of displaying true 3D graphics. Most video games are forced to use monocular cues to achieve the illusion of three dimensions on a two-dimensional screen, but the Virtual Boy was able to create a more accurate illusion of depth through an effect known as parallax. The Nintendo 3DS also uses this technology. In a manner similar to using a head-mounted display, the user looks into an eyepiece made of neoprene on the front of the machine, and then an eyeglass-style projector allows viewing of the monochromatic (in this case, red) image. It was released on July 21, 1995 in Japan and August 14, 1995 in North America and at a price of around US$180. It met with a lukewarm reception that was unaffected by continued price drops. Exactly 14 titles were released for Virtual Boy in North America, but only a few were met with positive reception. The system is rarely mentioned by Nintendo, however it is seen through microgames in WarioWare games. Nintendo discontinued the Virtual Boy within a few months of release. In 2001, Nintendo introduced the Game Boy Advance, the first major technological upgrade to the Game Boy line. Nintendo later released two revised models of the Game Boy Advance, the Game Boy Advance SP and the Game Boy Micro. The Game Boy Advance SP features a smaller clamshell design, and introduced a built-in screen light and rechargeable battery which became standard features for future Nintendo handhelds. The Game Boy Micro is an even smaller variant with interchangeable designer faceplates. The three Game Boy Advance models have sold 81.51 million units worldwide. On March 2, 2006, Nintendo released the Nintendo DS Lite, a redesigned model of the Nintendo DS, in Japan. It was later released in North America, Australia and Europe. As of December 31, 2013, Nintendo DS consoles have sold 154.98 million units, including 93.86 million Nintendo DS Lites. A second redesign of the Nintendo DS, the Nintendo DSi, was released on November 1, 2008, in Japan, on April 2, 2009 in Australia, April 3, 2009 in Europe, and April 5, 2009 in North America. It contains two cameras and downloadable software capabilities, plus a built-in flash memory and web browser. An SD card slot replaces the Game Boy Advance cartridge slot. A similar model, known as the Nintendo DSi XL, was released in 2010. It features the same configurations as its predecessor, but is slightly larger and features a large stylus designed for home use. As of December 31, 2013, Nintendo DSi consoles have sold 41.33 million units. Although the name and look of the device are similar to that of the DS series, the Nintendo 3DS (or shortly 3DS) is the successor to the DS and a brand new console. The Nintendo 3DS was released February 26, 2011. It contains three cameras, two on the outside (for 3D photographs) and one internal one above the top screen. The bottom screen is a touch screen comparable to the DS bottom screens, and the top screen is Wide Screen and an autostereoscopic 3D LCD. Autostereoscopy is a process that sends different images to the left and right eyes to enable the viewer to view the screen in 3D "without the need for special glasses". The 3DS is said to enhance Nintendo's online experience. In 2012, the 3DS XL was released, similar to the change between the DSi and DSi XL. It has 90% larger screens and design changes such as a matte finish and the stylus in a more accessible area. The 2DS was released on October 12, 2013. It is a variant designed to be affordable without the clamshell design or 3D capabilities of the 3DS. Another redesign, the New Nintendo 3DS, was released in Japan in October 2014, Australia for November 2014, and everywhere else in February 2015. It includes a C-Stick, ZR and ZL shoulder buttons, and a faster CPU, allowing for more software specifically for the New Nintendo 3DS (such as Xenoblade Chronicles 3D). Like the original 3DS, the New Nintendo 3DS also has an XL form. As of December 31, 2013, Nintendo has sold 42.74 million units, including 15.21 million Nintendo 3DS XLs and 2.11 million Nintendo 2DS units. The latest handheld console was the New Nintendo 2DS XL, which was released in July 2017 across five different countries. The Nintendo Switch is a hybrid home and portable console. More information can be found in the home consoles section of this article. Game Boy Printer – an adapter designed for printing things from the Game Boy onto adhesive stickers. For example, it was used for printing out Game Boy Camera pictures and Pokémon information from the Pokédex in the Game Boy Pokémon games. Nintendo 64DD – only released in Japan, this add-on system's games are on rewritable magnetic disks. Games released include a paint and 3D construction package, F-Zero X Expansion Kit, for creating new F-Zero X tracks, a sequel to the SNES version of SimCity, SimCity 64 and others. 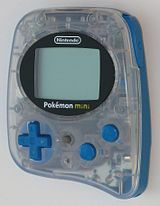 Pokémon Mini – unveiled in London at Christmas 2000, the Pokémon Mini was Nintendo's cheapest console ever produced; with games costing £10 ($15) each, and the consoles costing £30 ($45). This remains the smallest cartridge-based games console ever made. Sales of this console were mostly poor. Mobile System GB – released in Japan on December 14, 2000. The Mobile System is an adapter to play Game Boy Color games on mobile phones. Pokémon Crystal was the first game to take advantage of the Mobile System. The player can hook an adapter to their Game Boy and connect it to a mobile phone which people can receive news, trade, and battle with other players across Japan. GameCube Microphone – used in Karaoke Revolution Party, Mario Party 6, Mario Party 7 and Odama for the GameCube. It recognizes basic sounds and incorporates them into gameplay. Pokéwalker – a Pedometer used in Pokémon HeartGold and SoulSilver that can be used to enhance your Pokémon HeartGold and SoulSilver game by giving some special Pokémon and items as well as other added benefits that reward depending on how many steps one can take. Fit Meter – a portable accessory for use with the Wii U game, Wii Fit U, that tracks the number of steps taken and the elevation climbed. Can be synced with the game using the Wii U GamePad. ^ a b c d e f g h i j "Consolidated Sales Transition by Region" (PDF). Nintendo. January 28, 2014. Retrieved January 29, 2014. ^ "Iwata Asks: Game & Watch". Nintendo of America. Retrieved June 23, 2013. ^ Sheff, David; Eddy, Andy (1999). Game Over: How Nintendo Zapped an American Industry, Captured Your Dollars, and Enslaved Your Children. GamePress. p. 27. ISBN 978-0-9669617-0-6. Nintendo entered the home market in Japan with the dramatic unveiling of Color TV-Game 6, which played six versions of light tennis. It was followed by a more powerful sequel, Color TV-Game 15. A million units of each were sold. The engineering team also came up with systems that played a more complex game, called "Blockbuster," as well as a racing game. Half a million units of these were sold. ^ "Nintendo's classic Famicom faces end of road". AFP. October 31, 2007. Archived from the original (Reprint) on November 5, 2007. Retrieved November 9, 2007. ^ Nintendo. "NES Classic Edition". Retrieved March 15, 2017. ^ a b c Schiesel, Seth (November 24, 2006). "Getting Everybody Back in the Game". The New York Times. ISSN 0362-4331. Retrieved August 20, 2017. ^ a b "Nintendo hopes Wii spells wiinner". USA Today. Retrieved August 20, 2017. ^ Casamassina, Matt (March 29, 2006). "Revolution's Horsepower". IGN. Retrieved August 20, 2017. ^ Boyes, Emma (February 23, 2007). "Study: Wii kids lose weight". GameSpot. Retrieved August 20, 2017. ^ "Iwata: Wii Sports 2 benched for now". GameSpot. September 18, 2007. Retrieved August 20, 2017. ^ a b c "Wii U review". Polygon. November 18, 2012. Retrieved August 20, 2017. ^ Caoili, Eric. "Nintendo Unveils Wii U, Controller With Built-In 6.2" Touchscreen". Gamasutra. Retrieved August 20, 2017. ^ "Wii U's online gaming and 'Miiverse' outlined, including video chat and web client". The Verge. Retrieved December 24, 2014. ^ "Nintendo reveals English version of 'Mii WaraWara': the WaraWara Plaza". Polygon. Retrieved December 24, 2014. ^ "Nintendo shutting down Wii U TVii service in August". Polygon. Vox Media. Retrieved July 25, 2015. ^ Nowak, Peter (December 30, 2013). "Year in review: The biggest tech flops of 2013". CBC News. Retrieved December 30, 2013. ^ Suellentrop, Chris (November 24, 2013). "Mario Tries to Rescue His Console". The New York Times. Retrieved December 12, 2013. ^ Pereira, Chris (June 2, 2014). "Mario Kart 8 Sells 1.2 Million, Becoming Wii U's Fastest-Selling Game". GameSpot. Retrieved August 20, 2017. ^ "Nintendo at E3: A comeback is always just a game away". Ars Technica. Retrieved August 20, 2017. ^ Phillips, Tom (June 1, 2015). "Splatoon is Wii U's fastest-selling new franchise in UK". Eurogamer. Archived from the original on June 1, 2015. Retrieved June 1, 2015. ^ Makuch, Eddie (January 31, 2017). "Wii U Production Ends Worldwide". GameSpot. Retrieved August 20, 2017. ^ Nintendo (October 20, 2016). "First Look at Nintendo Switch" – via YouTube. ^ "Nintendo Dedicated Video Game Sales Units". December 31, 2018. Retrieved March 20, 2019. ^ "A Brief History of Game Console Warfare: Game Boy". BusinessWeek. Archived from the original on May 9, 2007. Retrieved January 25, 2008. ^ "GBC Hardware Info". The Internet. Retrieved September 27, 2007. ^ "Nintendo DS Frequently Asked Questions". Nintendo. Retrieved April 2, 2006. ^ Other Stuff. DieHard GameFan. Volume 1. Issue 12. No.12. P.163. November 1993. ^ "Gateway System Gets Shanghaied". GamePro (56). IDG. March 1994. p. 186. This page was last edited on 13 April 2019, at 14:00 (UTC).